Life. Business. Memories. Story. Identity. Data Recovery Services We Offer! TTR Data Recovery Inc. is a professional data recovery company with locations across the U.S from the east coast to the west coast that provides proprietary data recovery services to individuals, corporations, government and non-government entities, and small businesses. Our ISO 9001 certified quality management system ensures your hard disk drive data is securely recovered — we also offer same day emergency data recovery service. If your RAID goes rogue we’ve got you covered. TTR Data Recovery can help with Raid 0, Raid 1, 5, 6, 10, 50, and all other types of RAID repair. No fees for failed attempts! If your server goes down unplug the hardware and call TTR Data Recovery. We’ll work with you to find the best solution. We offer “no data, no charge” guarantee. When Solid State Drives fail, what’s the next step? Use our free shipping to get your SSD in the hands of our IACRB data recovery technicians faster. Find out why we’re the best! Flash media are often faulty. If your flash drive, memory card or SD card stops working, our personal data recovery services can help you reclaim irreplaceable moments. Do you have damaged tapes, or good tapes but no tape reader? We can recover or extract data from all types of tapes in any condition with any type of backup software. Many of our clientele loves the superior performance of Apple products. However, just like any piece of technology, it is still exposed to the risk of data loss. Storing data with the help of a local network is a safer and more practical use for larger organizations. In cases of data loss incidents on these storage platforms, we got you covered! Alot of businesses turn into databases to organize crucial information for reference and other purposes. When an employee accidentally deleted an entry from it and wrecks the informational structure of the organization, call in TTR Data Recovery to retrieve it for you. A more automated storage solution for personal and enterprise use, it aims to provide virtualization functionality for server applications and desktop applications. Our data technicians are trained to handle sophisticated platform! Our Superior Data Recovery Process! Our data recovery process starts with your decision to rely on TTR Data Recovery. Once the device is in our possession, evaluation and assessment follow. From there, you can choose to give a “go” signal for our data technician to start with the retrieval process. Our data technicians are on standby for your queries and concerns. We will contact you thru email and relay information necessary instructions pertaining to your case. You can search for an emergency data recovery lab located at your state and drop off the device there for an immediate assessment. You have the power to choose if you want your case report in less than 24 hours or you can wait for a free Diagnostic Report that can last in 1-2 working days. TTR data recover aims to provide clientele with the best of the best data recovery services. Thus, we are equipped with the right tools and our data technicians have undergone necessary training that is utilized inside or outside on our ISO 5 certified class 100 cleanroom. When the whole retrieval process is finished, our data technicians will send you a final list of recovered files for you to verify. Once finalized, the recovery process will begin. After you have verified the final list of recovered data, payments are arranged and you can finally have your files back. Why Trust TTR Data Recovery? Arguably The Most Trusted Leader in Data Recovery Services! With the advent of technology and its integration to human lives, people of all ages and statuses turn to its accessibility, convenience and functionality. Whether it’s for personal, academic or entrepreneurial purposes, people use data and it has become an integral part of their lives. But, unfortunate cases happen and data can be lost due to the following reasons, human errors, technological causes and natural disasters. All of which is inevitable to happen, it’s only a matter of when it is going to happen. TTR Data Recovery was founded to provide professional data recovery services for the residents of the United States. We have locations in states from the east coast to the west coast to bring the service closer to our clientele. Our data recovery services are not limited to personal use only but we also cater to small-scale businesses, enterprises of any industry, government entities, or organizations that need our help concerning data retrieval. Our data technicians are skilled to recover data from all media platforms and storage devices ranging from RAIDS, flash drives, hard drives, tapes, memory cards, cellphones, laptops, desktops, cameras, and many more. All you have to do is to give us a call and we’ll be happy to provide high-quality data recovery service for you! TTR Data Recovery operates under laws, policies, rules and regulations that ensure excellent customer service delivery. We are proud to say that we are committed to providing data recovery services that will make our clients breathe a sigh of relief and leave our labs with smiles on their faces. Our Data Recovery Services Are Certified By Industry Experts! 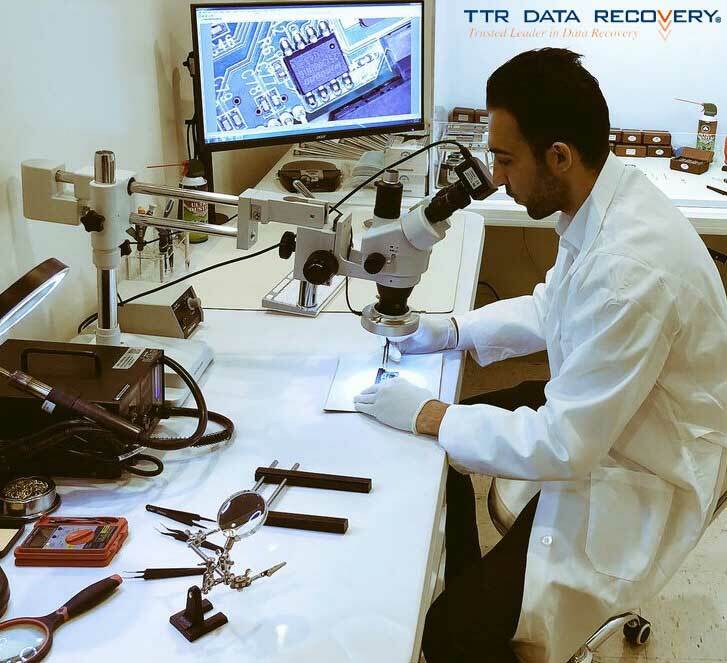 TTR Data Recovery recovers data from all types of electronic storage devices, including hard drives, RAIDs, tapes, flash drives, memory cards, phones, tablets, cameras, laptops, desktops, and many more. If it stores data, we can recover it! We believe that every clientele deserves world-class quality under the guidance of ISO 9001 Certified Quality Management System. Under the protection of SOC Type II regulations and provisions, all of the data you provide us is secured and is deemed as confidential. We are proud to proclaim that TTR Data Recovery is the only data recovery company that is IACRB certified. We are simply the best in what we do! Our clean rooms are ISO 5 Certified class 100. This enables our data technicians to perform sophisticated data recovery procedures at ease! This certification only proves the aim of TTR Data Recovery to provide top-notch and quality data recovery services for government entities! Acquiring a certification from Apple is rare. We made sure to get our tech pros certified allowing us to extend our services to Apple users! To be given an A+ rating by the Better Business Bureau, more than speaks for the quality of our service and our commitment to excellence. What better way to give you an indication of who to trust regarding data is none other Dun and Bradstreet Corporation. Our services do not only go from east coast to west coast but to the stars as well! The brightest minds only trust TTR Data Recovery for humongous data recovery missions! We know how serious and rampant identity theft and data breach cases are. TTR Data Recover is PCI standard compliant so our clientele knows their privacy is safe! Data loss can happen at any given time. From the accidental deletion, occasional human errors or technological fails, it is bound to happen. When that occurs, trust that you have someone you can fully rely on in retrieving your files and salvaging your device like the way it used to be before you hand the device to the nearest emergency data lab located in your state. No matter your need, TTR has data recovery services to get you back on track!